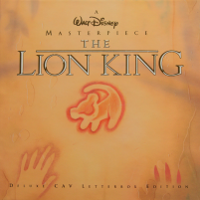 The Lion King Deluxe Box is, by all means, the most interesting collectible, which every Lion King fan should have in his possession. 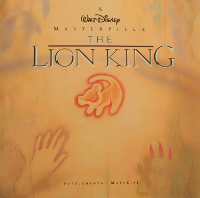 This marvelous box contains 4 double-sided Laserdiscs, whereas two of them contains the movie and additional two double-sided Laserdiscs with bonus material like the half-hour documentary "The Making of The Lion King", lots of concept pictures and further video clips about most aspects of the movies and the people behind. 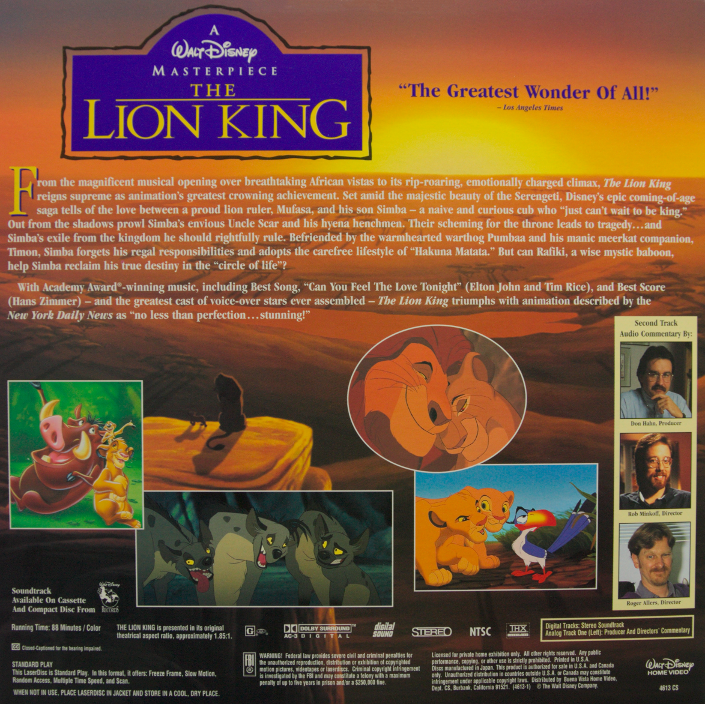 In contrast to the German CLV edition, the two double-sided CAV Laserdiscs presents the movie in its original aspect ratio of 1.85:1 with a very high quality, assuming you also have the proper player. Nearly perfect sharpness and bright colors are some of the image highlights. Only a little noise in some colors are visible but it can't cloud the overall good impression of the image quality. Of course this is review has now to be seen in a relative way, then since the DVD or even the Blu-Ray release, it is hardly fair to compare a technique that was developed nearly 40 years in the past. During that time it was the best way to watch the movie compared to the VHS version. Note that you see the movie here in the same way as it were shown at the cinema 1994. 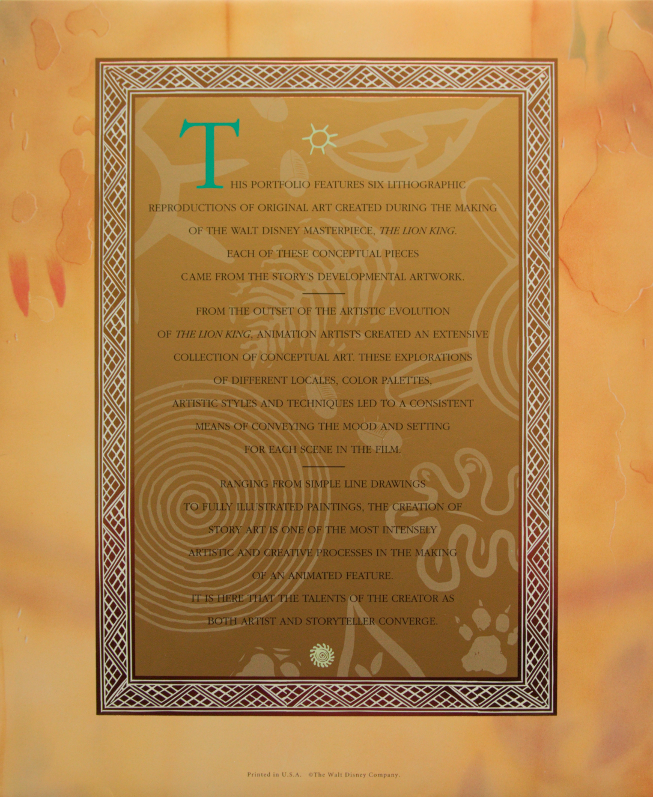 It contains no "Morning Report", the crocodiles are not modified and all the other small things that changed with the Special Edition release. 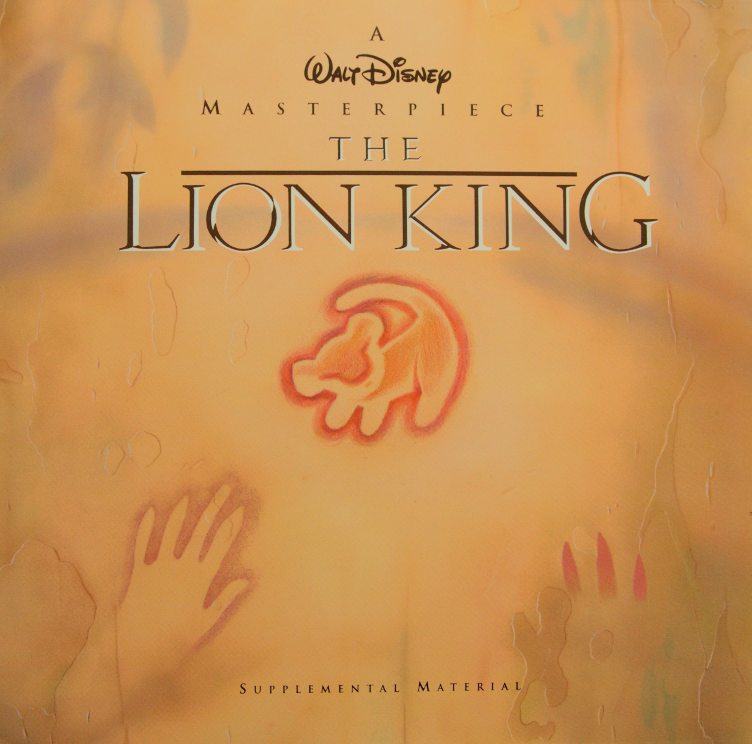 Beside the English analogue and 2.0 PCM Stereo track, there is also a commentary track with lots of background informations, spoken by the producer Don Hahn and the directors Roger Allers and Bob Minkoff. It is both funny and very informative. 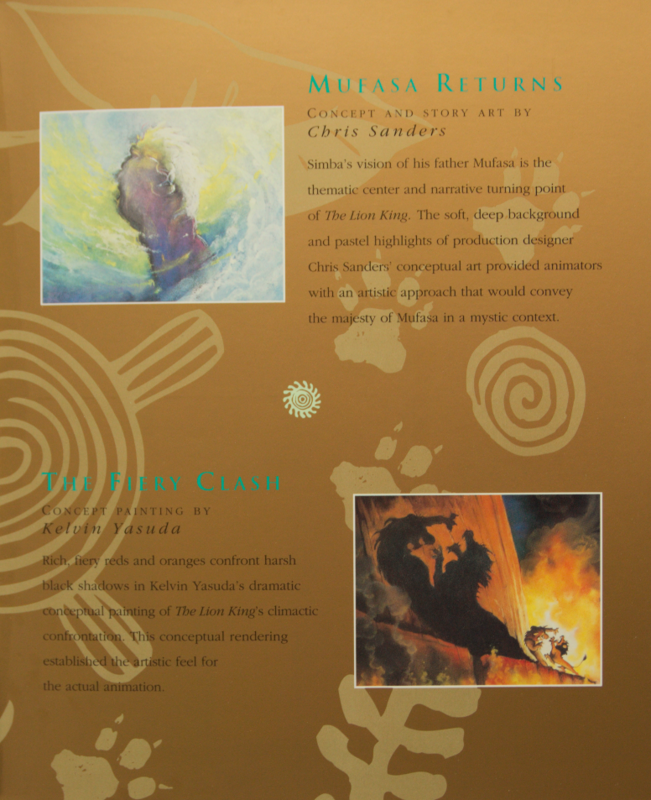 The commentary track is also on the DVD, in case you are interested. 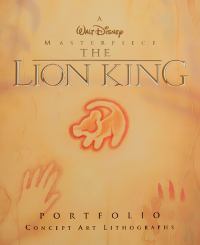 The audio quality of the digital PCM track and even the analog track combined with the beautiful music and score would have blown your mind back in 1995. 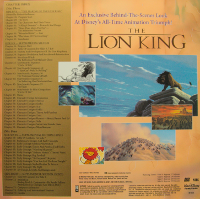 There were a lot of demo material with the opening sequence of The Lion King at that times, which shows the terrific Audio quality of the Laserdisc. The digital track is without a doubt the best advantage over the VHS version. 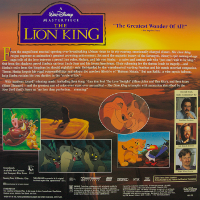 Last, but not least and this should have been mentioned right at the beginning of this review is the fact, that the Laserdisc also contains a 5.1 AC-3 Audio track, which is the same mix as used in the cinema form 1994. Although compared to modern standards the technical specs are not very intimidating with its 384 kbit/s and a sample rate of 48 KHz, but it offers you to hear . 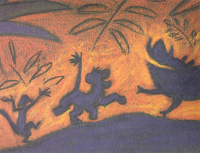 The sound mix is also different from the DVD and Blu-Ray version, for instance the basses are much more present in scenes like the "stampede", or the end of Circle of Life. Thereby the sound stays clear with a high dynamic range, considered with this limited bandwidth. Nonetheless, in order to hear the AC-3 soundtrack a simple Dolby Digital Receiver is mostly not enough, because the audio track is RF-modulated, so you need a demodulater before you can feed the signal in your home cinema system. Older Hi-Fi receivers had an integrated RF-demodulator, but this was even in that times very rare, so an additional box was required, which is very expensive today. 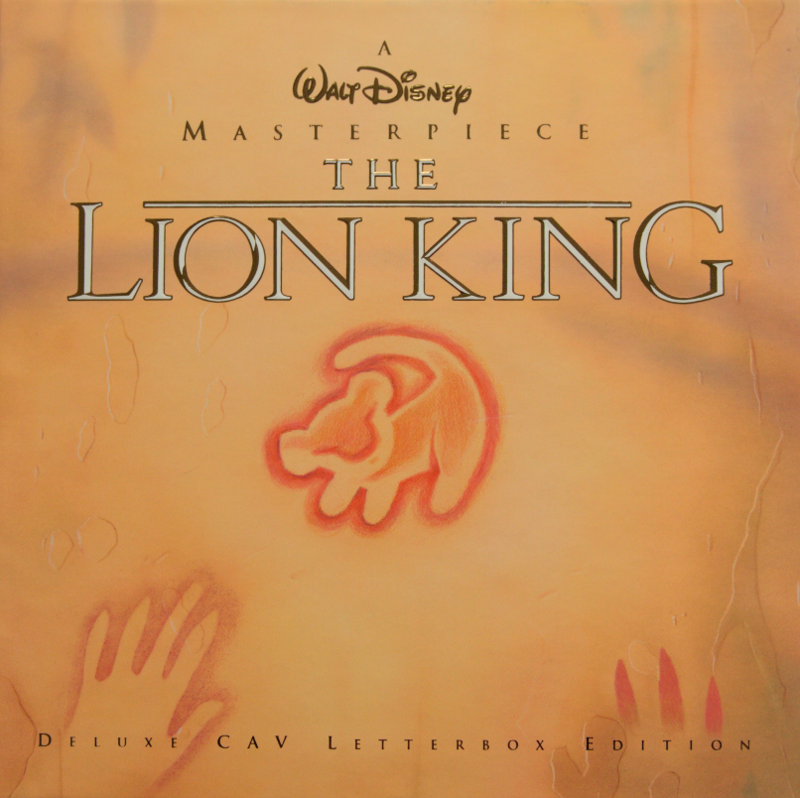 I didn't want to pay so much money for such a box and I also wanted to preserve this track, even when my Laserdisc is lost one day (hopefully a long time till then). So I decided to build my own demodulator and attempt to store the digital date stream afterwards. Therefore I build up the system you see in the left picture. Sparing most of the details, the chain of information flow is the following: first I receive the RF-modulated stream with a base frequency of 2.8 MHz which has roughly a peak-to-peak voltage of 70 mV. Amplified with a low noise and high gain two stage amplifier I get roughly a peak-to-peak voltage of 2 V, which is than connected to a comparator, with a definable threshold. The comparator just checks if the incoming signal is above a certain threshold or below. 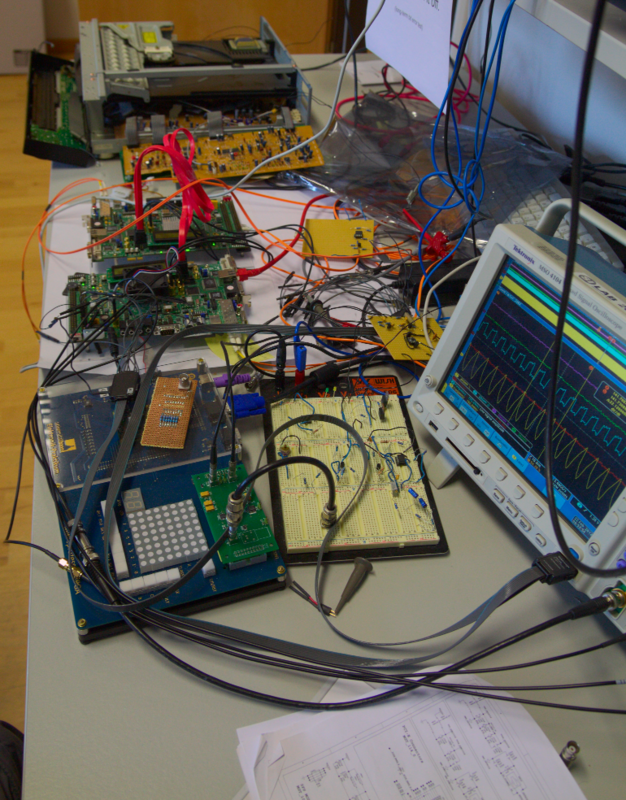 If it is above a logical one will be applied to the connected Field Programmable Gate Array (FPGA), or a zero otherwise. 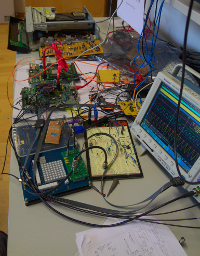 The FPGA now does a lot of magic, like checking the incoming signal, and store them in a ring buffer. This buffer is then read out over USB and I get my AC-3 digital signal. Afterwards a little bit of post-processing was required, to isolate the real Audio core and skip idle data. I used the checksum of every AC-3 block for that. 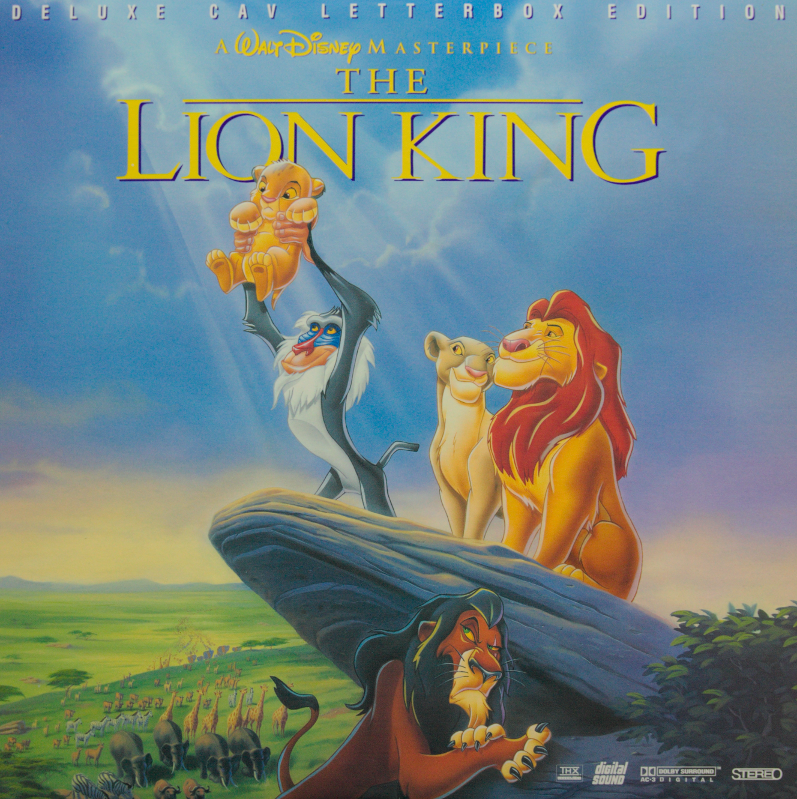 Cover of the included Laserdisc set containing the movie. 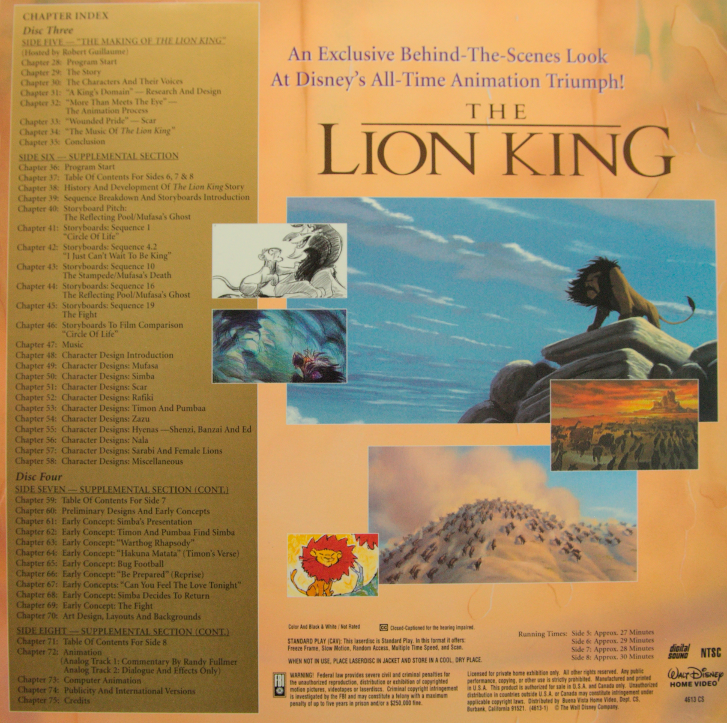 Backside of the included Laserdisc set. Middle of the included Laserdisc set. The other two Laserdiscs of this deluxe box contains the supplemental material, including on the first disc the documentary "The Making of The Lion King" with Robert Guillaume. It is about the background of the technique and the people behind The Lion King. Interviews with different artists exchange with short video clips taken during the creation and planing phase. This is the most interesting part of the supplemental material. 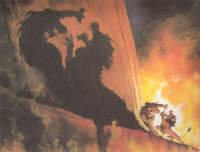 It was also shown in Television and released on VHS. 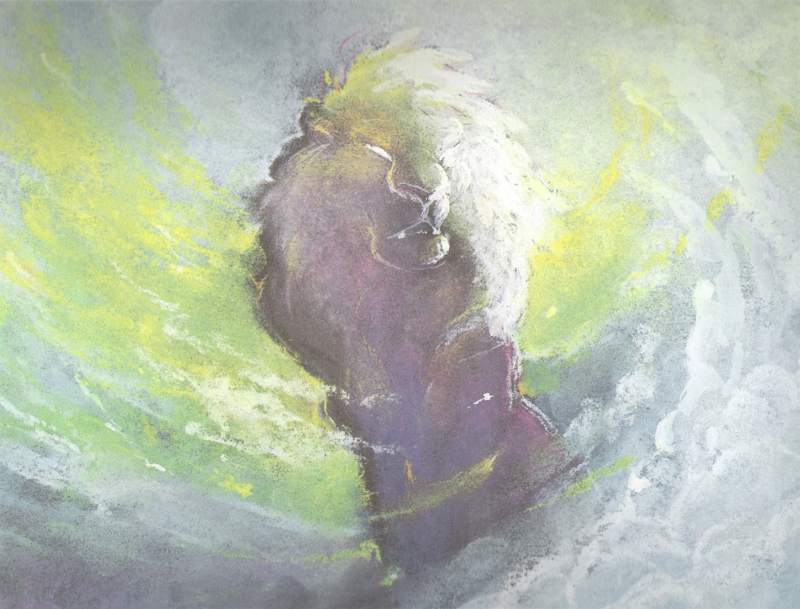 On the other side of the same disc, the history and development of the story is presented and also sequences from the storyboard and character design concept pictures. The next disc contains on its first side, further concept pictures, but also video clips of cut scenes or in an early production state. 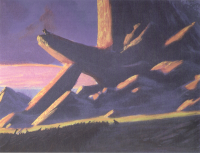 On the second side are interviews with detailed background information about the animation, the special effects and the computer generated images. For a detailed listing, please take a look on the pictures. 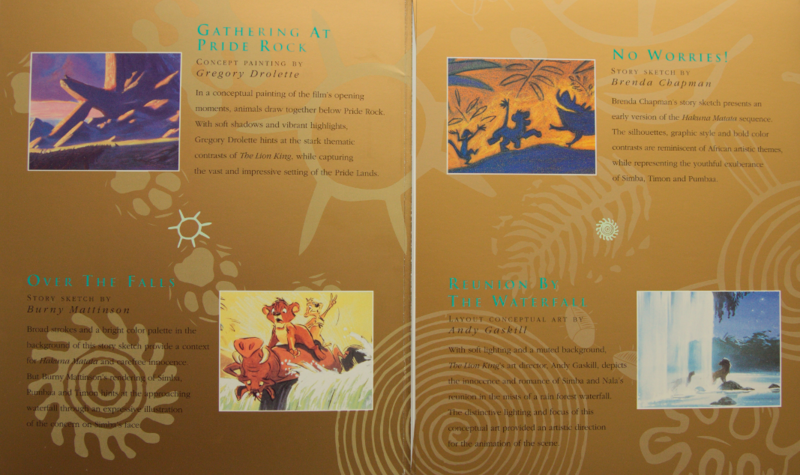 Backside of the supplemental disc of The Lion King, with a table of content. 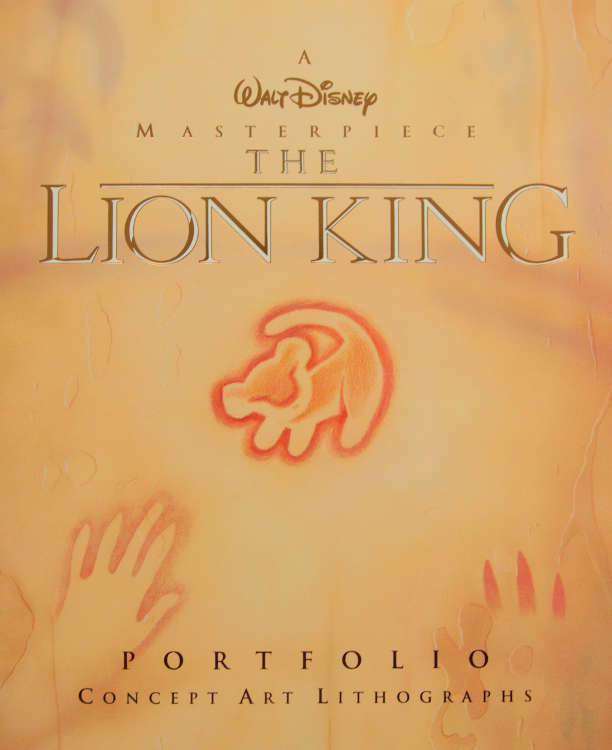 Cover of the lithographs package. Backside of the lithographs package. 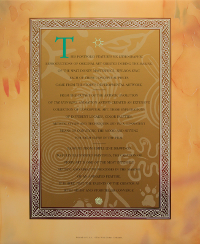 Side of the lithographs package. Middle of the lithographs package. Lithograph 1: Early concept of Pride Rock and the opening or end sequence. 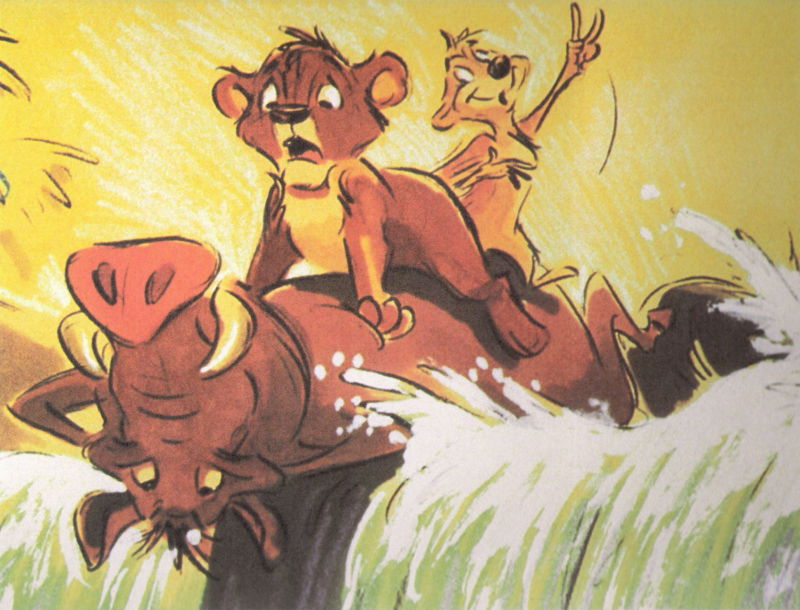 Lithograph 2: Concept picture in the jungle with Simba, Timon and Pumbaa. 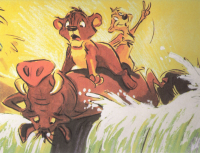 Lithograph 3: Another concept picture of Simba, Timon and Pumbaa. Lithograph 4: Early concept picture of the "Can You Feel the Love Tonight" waterfall scene. 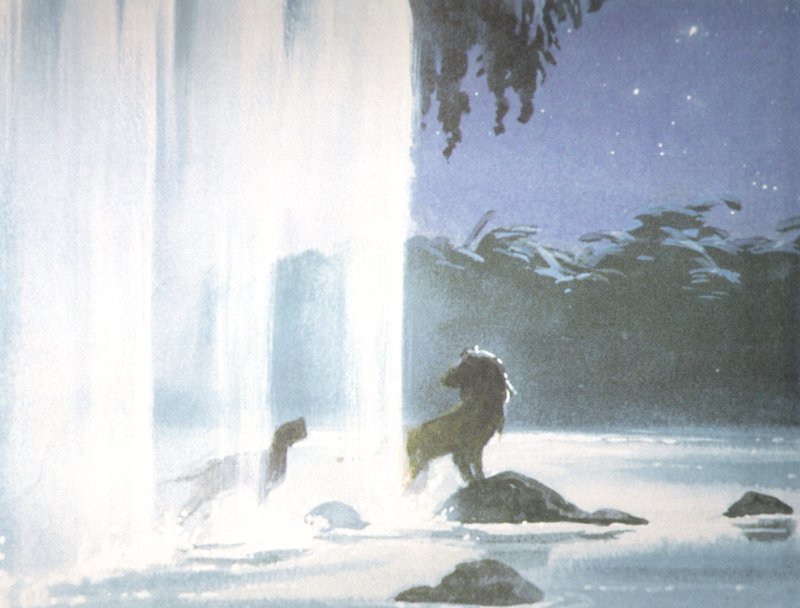 Lithograph 5: "Mufasa's ghost" concept. Lithograph 6: Concept of Simba's fight with Scar.